While I am always eager for whatever comes my way with this series, I find that the ongoing saga of Elena and Raphael is the story that is at the heart of things for me. 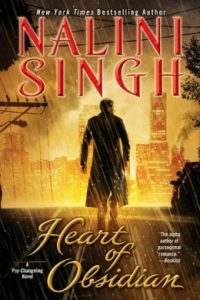 Archangel’s Heart is a story of an ongoing love affair for the ages that doesn’t grow stale, but proves again why Rafael and Elena are together and demonstrates how far they have come as they battle an evil rotting in the shadows and shine light into the secrets of Elena’s past. 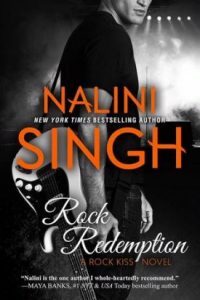 And if they’re rock star romance power wasn’t enough, Aodhan and the Cadre along with a new cast of angel characters have plenty of page time as the ongoing threat of Lijuan and the Cascade continues to pose trouble in the world. 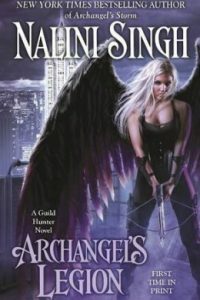 I found this ninth installment in the Guild Hunter series a gem from cover to cover. 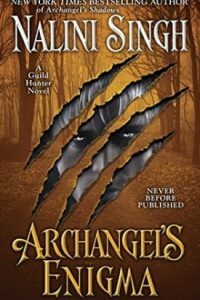 The Guild Hunter series is one that is best enjoyed in order particularly this one as it references things back all the way to the beginning and builds on the series arc that has continued through the series. 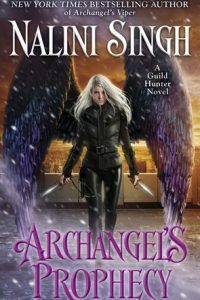 Elena and her archangel are summoned to a meeting with the Cadre of Archangels to discuss the trouble building in Lijuan’s territory as a result of her two years of silence. There is speculation that she has gone into the Sleep while others say she is planning something big. Meanwhile, the Cascade of magic induced events has been holding off on the horizon though Elena feels that at any moment the other shoe will drop and it will crash into them yet again. Illium has recovered from near destruction and Aodhan continues to show he is ready to rejoin the world again, but Elena worries for both her Blueboy and her Sparkle along with many others. Rafael has to appear for the summons or suffer the consequences. The meeting of the Cadre was called by the aloof sect of angels called the Luminata who choose to live apart from the world seeking a higher plane. The Luminata live in a neutral place of their own and are neutral in allegiance. Though, he would protect his Elena- his Guild Hunter, she, too, must be at his side in a show of strength and part of angel politics. His Guild Hunter is a strong warrior, but she is still a fledgling angel and holds his heart. 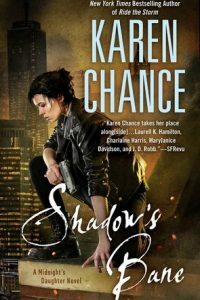 Their arrival at the hidden city brings to light a mystery from Elena’s past and a growing sense of unease that someone is working in the shadows for their own purposes. Rafael and the Cadre must figure out what to do about Lijuan’s territory, but he and Elena must also work to stop a new threat as well. And the Cascade has returned again full of sound and fury. 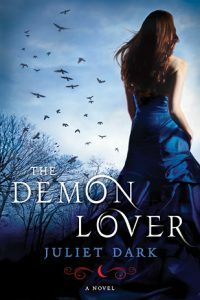 Alright, if I didn’t love this series for its romance (and I do) or for it’s world of angels and vampires and gifted human hunters, then the exciting adventures and mysteries that occur would definitely hook me in. Rafael and Elena’s ongoing story as their relationship grows and reaches new depth is a source of warm delight. I love that they actually grow as individuals and a couple. He is domineering and protective, but she is mindful of motives and situations. And yes, a heroine who is not stupid. 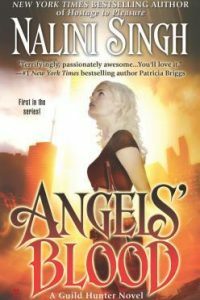 Elena knows her strengths, but she knows that she is a feeble match for the power of older angels, especially the archangels. Rafael provides Aodhan and he cautions her and she listens, but she also makes it clear that there are times that she must stand on her own strength and he struggles, but does let her. They are true partners in love and in their position as Archangel and Consort. I loved the secondary story that was running alongside of Aodhan. Much of his past is a mystery. I know he suffered horrendously and this nearly broke him, but in this book, Rafael has given Aodhan the responsibility of being his and Elena’s guard since they are only allowed one to accompany them to the Luminata’s city. Aodhan desires to prove himself and he does. There is the temptation to join the sequestered angels where he is not prodded to put himself forward or heal from his pain, but he is Elena’s guard. I can’t wait to get more of his story in the future. The blend of mystery, political intrigue, and angel conflict for the action side was well done. The mystery is not difficult to figure out and isn’t meant to be, but it was fun and exciting watching it all unfold. 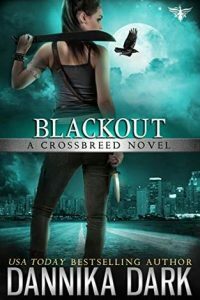 The author has a great sense of pace, atmosphere, and timing so that it all built to the right moment when I was kept in high anticipation. What came was a page turner and what came afterward was just the right amount of denouement to leave me warmed and satisfied. And also wanting more. All in all, a strong series proves why it continues to be much anticipated and a feverish amount of anticipation and excitement for each release that never disappoints. 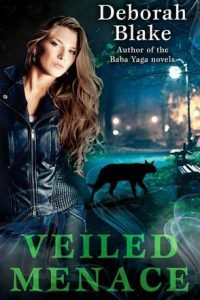 Guild Hunter series is a crossover between Urban Fantasy and Paranormal Romance that I can heartily recommend to lovers of both. 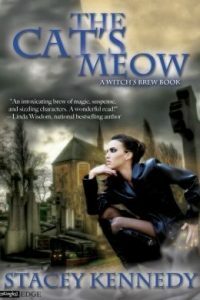 Passion, mystery and action in a paranormal world are not to be missed. I’ve been writing as long as I can remember and all of my stories always held a thread of romance (even when I was writing about a prince who could shoot lasers out of his eyes). I love creating unique characters, love giving them happy endings and I even love the voices in my head. There’s no other job I would rather be doing. In September 2002, when I got the call that Silhouette Desire wanted to buy my first book, Desert Warrior, it was a dream come true. I hope to continue living the dream until I keel over of old age on my keyboard. 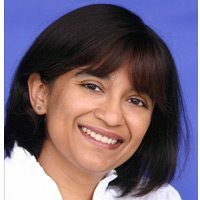 I was born in Fiji and raised in New Zealand. I also spent three years living and working in Japan, during which time I took the chance to travel around Asia. I’m back in New Zealand now, but I’m always plotting new trips. If you’d like to see some of my travel snapshots, have a look at the Travel Diary page (updated every month). So far, I’ve worked as a lawyer, a librarian, a candy factory general hand, a bank temp and an English teacher and not necessarily in that order. Some might call that inconsistency but I call it grist for the writer’s mill. Yes, you really do, Angela. 🙂 So worth the catch-up reading. I so loved this book too. While I’m anxiously awaiting books for some characters (*cough* Bluebell and Sparkle *cough*), it was great to have Elena and Raphael as the main couple again. I really loved the time in Morocco. I can’t wait for the next book. Great review. Oh yeah, really need those guys to get some prime time page time. 🙂 I’m also curious about the snake vampire in Rafael’s seven. 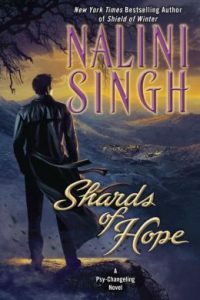 Oh yep, I’ve done the house search thing just last week and, ha, it was for a Nalini Singh book in her other series that I plan to read next year. I think you’ll really like these, Anna. I’m so late in this series. I remember reading book 1 and liking it and I even think I have book 2 but haven’t read it or maybe… or is it book 3? I’ll have to check this out but well I’m late! I like some more than others, but I’ve never not liked her books. She’s a fantastic writer. Yeah, love that she’s from Down Under. oh glad to know that this one didn’t disappoint!! 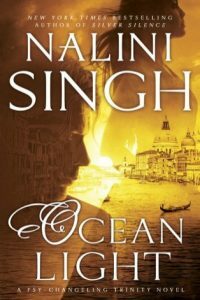 Isn’t Nalini Singh great, and she has done wonders with this series. 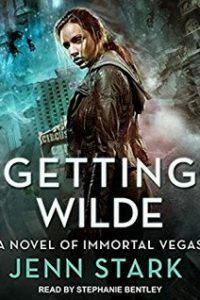 I am a bit behind so I just skimmed your review, but definitely a book I am looking forward to reading once I get to the previous books in the series. Great review. She is amazing. I’ve always been up to date on this series, but just recently started her psi-changling series after all this time. So different, but still good. LOL, I skim when I see a post on a future series book I haven’t read yet, either. I love when the characters grow as individuals and as a couple! I keep meaning to start this series. Oh you really must, Grace. I love these and get excited to see others enjoy them, too. I kind of skimmed this because I do have some of the early ones of this series already. I do love the sound of such a good romance! I started her Psi-Changling series and three books in, I love it. I also read her entire Rock series. She’s good! I will definitely get to these someday! Oh yay! I think you’ll adore Guild Hunter series as much as the others. I have picked her Psi-Changling series for my next one to catch up on. I’m starting the third book next. I loved this one so much, Sophia! The way Raphael and Elena’s relationship continue to grow, and their strong love, affection, loyalty and respect always get to me! And we got to go to Morocco with them!! I’m so happy you loved it, too – it’s always such a great feeling to pick up a fave series and just be completely enchanted with everything from start to finish! Yes, yes, yes, exactly, Lexxie. 🙂 It was lovely to pick up an ongoing story about a favorite couple. 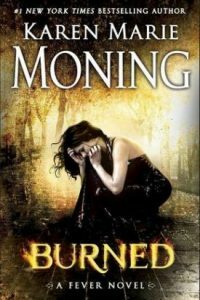 I think I read the two books of this series and thought they were okay, I gave them both a 3 star rating on Goodreads. I think things got a bit too dark for me in book two and I never continued the series after that. Glad to hear you’re enjoying this series and that Elena and Raphael their story keeps your attention. The sound like a great couple. And it’s great when a book does well on all aspects. Now you have me thinking back and the early books are vague memories. Haha. Yes, there are some grittier moments in this series for sure. Yes, I do love each time the series comes back to this couple’s story though it’s fun that others get to be the main characters as it goes along.